I have a Samsung Galaxy and it is 32 GB. I have so many apps, videos, music, and pictures that it has almost filled up the phones storage. I know I can connect my USB cable to my computer and move the pictures and videos to my computer to make more storage space on my phone. My issue is this: What if I am travelling and I need to “offload” some photos and videos from my Samsung Galaxy Phone when the internal storage is almost full? I take photos at 16 MP and videos at 4K on my phone so it fills up fast! Is there a device, method, or easy way to move files off my phone somewhere besides the “cloud”? I do not want to pay to use the “cloud”. Please help, I am going on a vacation and need a cheap and easy solution fast! When your Android phone or tablet is getting low on storage because of large apps, pics, videos, and music files, there are multiple solutions to clear storage on your phone. Have you received an error message suggesting you do not have enough storage available on your Samsung Galaxy? There are many ways to fix that. 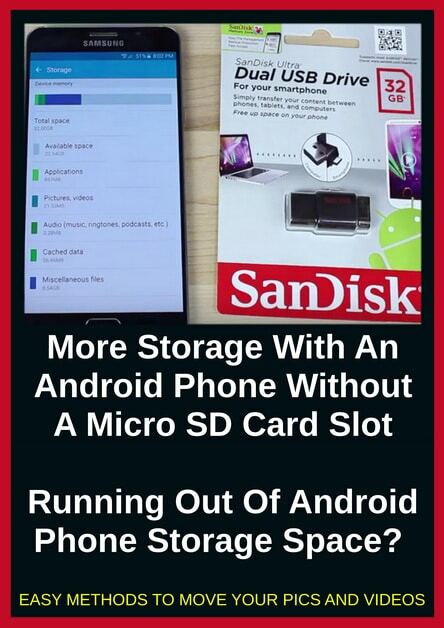 Here’s how to get more storage on an Android phone or tablet without a micro SD slot and to remove the big files from your phone to free up storage space so you can take pictures and videos with no worries. How to get more storage in Android. Many Android phones and tablets support USB OTG aka (On The Go) that allows you to plug in peripherals such as storage drives. 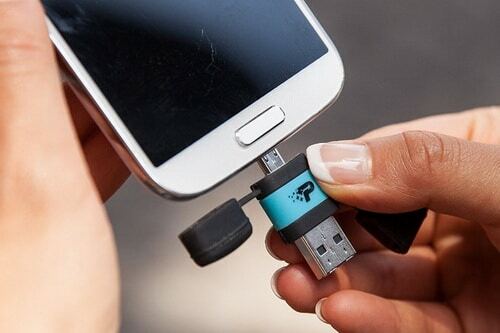 This is a flash drive for Your OTG Android Phone. It is USB 3.0 and has microUSB Connectors. It has fast transfer speeds from drive to phone. It also automatically detects when connected. You are able to transfer all videos and pictures off your phone to view later. Quickly and easily transfer your files between OTG-enabled Android smartphones and tablets and PC and Mac computers. Free up space to add more photos, videos, songs, and other files. 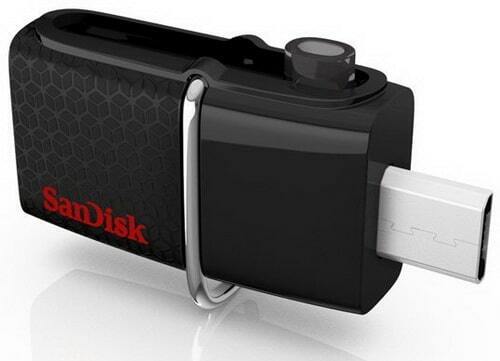 Simply connect the SanDisk Ultra Dual USB Drive 3.0 to the micro-USB port of your Android device and move up to 128GB of content to the drive. Quickly transfer files at up to 150MB/s from drive to computer with the high-speed USB 3.0 connector. Spend less time waiting to transfer a full-length movie to the drive than with a standard USB 2.0 drive. The SanDisk Memory Zone app (available on Google Play) helps you manage your phone’s memory, making it easy to move, view, copy, or back up your photos and videos to the drive, so you’re always ready to take more videos and pictures on the go. Media consumption on mobile devices has never been more popular but large HD files can take up device storage quickly. The Stellar Boost XT is here to fix that. Measuring in at less than 43mm long, the Stellar Boost XT is the perfect ultralight way to carry a full media collection and all of your data for use with Android 4.0 or higher smartphones or tablets and other computing devices that have a full size USB port. The duel-end micro USB and USB 3.0 makes it easy to transfer files between your Android device and your Stellar Boost XT. With the Stellar Boost XT, there’s no loss of performance with portability. The full sized USB connector provides up-to 110MB/s transfer speeds for quickly moving files. The Stellar Boost XT is made rugged, build to withstand the everyday use for the modern mobile user. The rubberized caps and body help protect your storage device from bumps and drops. The Stellar Boost XT is compatible with Android 4.0 or higher. 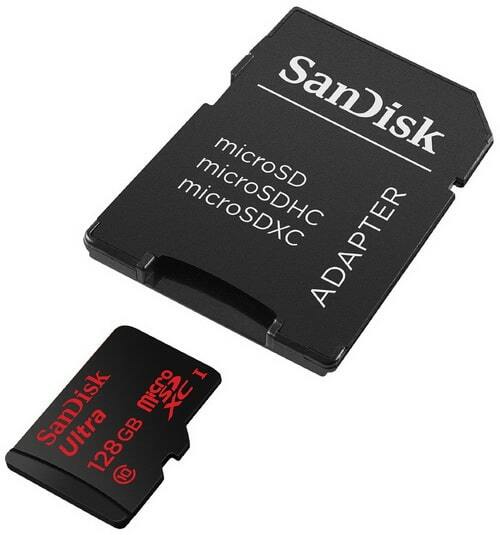 Boosts Memory By Simply Plugging In A Micro SD Card. Frees Up Memory By Storing & Playing Music Off Access. Takes Photos & Videos With Access. 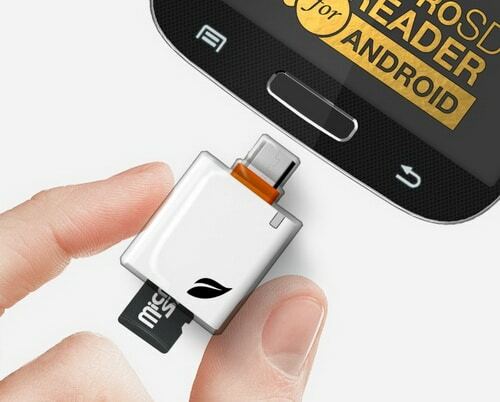 Transfers Content Easily Between Micro SD Card & Android Devices. Quick & Easy Access To Action Camera Footage. NOTE: You need a Micro SD card for this to work. Class 10 for Full HD video recording and playback. Memory Zone app lets you auto-manage media and memory for peak phone performance. Comes with SD adapter for use in cameras. Ideal for premium Android based smartphones and tablets. Fast transfer speeds of up to 80MB/s. Add up to 128GB of storage to your device. Class 10 for recording Full HD video. Read speeds of up to 80MB/s for fast file transfer. Inateck OTG Adapter Card Reader USB 2.0 HUB equipped with MS, M2, SD (HC), TF Card Slot & 3 x USB 2.0 Port is compatible with all device which support OTG function. It can work well with all Android devices WITH custom ROM/Kernel that support USB Host mode. Please make sure that your device Support OTG function first! NOTE: Playbook & NEXUS 4 & Samsung Tab 3 7.0 are NOT support OTG function. 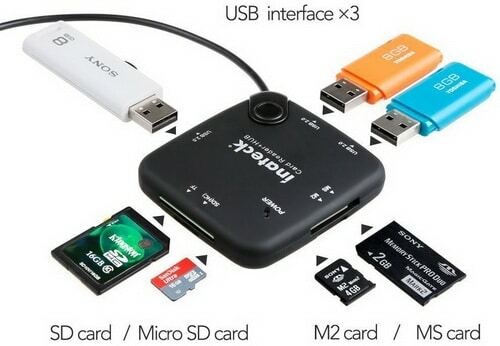 Interface: 3-Port USB Hub, M2 MS SD TF Card Reader, 3.5mm Power Port. USB lead length: About 7.5 inch (19cm). 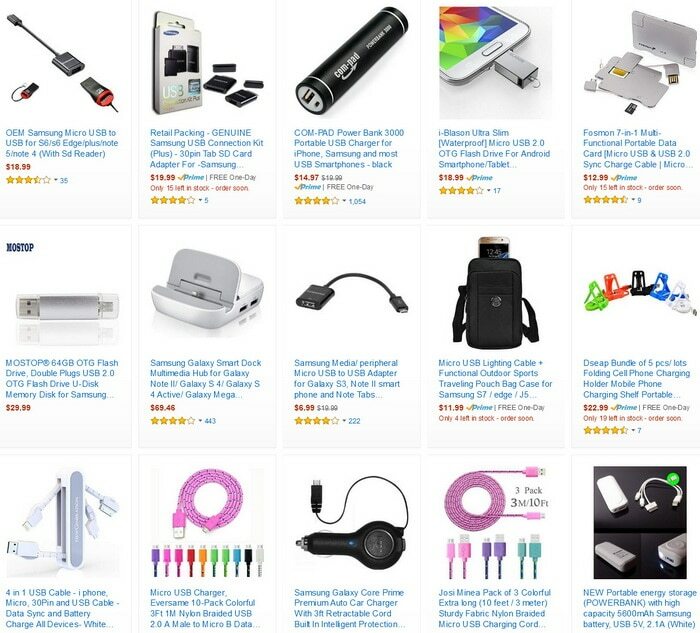 Supports OTG, mobile phone or tablet PC interface USB 2.0 micro-B’s.Compatible with Samsung Galaxy S4,S3, Galaxy Tab 4, Tab s, Note 3 and Note 2, and other micro usb OTG devices. Easy to use, just plug and play! This micro USB host OTG cable can fully replace the original USB Adapter, works perfectly with Samsung Galaxy S II, Nokia C7 and other Android devices (eg. XOOM) with custom ROM/Kernel that support USB Host mode; It also works with external hard disk, But you need external power source for the hard disk. The Perfect Device On The Go. The product is compact, easy to carry and the perfect companion on the road! Make your smartphone even smarter! How to get more storage for your Android? Delete apps and clear your cache! Many times you do not need more storage, you simply need to make better use of what you have. Delete unwanted apps. Large movies, giant photos. Your phone most likely came with several apps you have no interest in using, and you’ve probably since installed even more that you never use. Clearing your app cache can also help to solve problems with crashing apps. Go to Settings, Apps, and go through each app and clear the cache as required or delete them if you do not use them. One final option you have for getting access to more storage on your Android device is by using a wireless hard drive. A wireless hard drive is exactly the same as a normal portable hard drive, but you connect to it through Wi-Fi. If you do not like the options above, use the “cloud” service. It costs money and if it is hacked, someone can take all of your photos and videos. Have better suggestions for making more storage on your Samsung Galaxy phone? Please let us know by leaving a comment below.